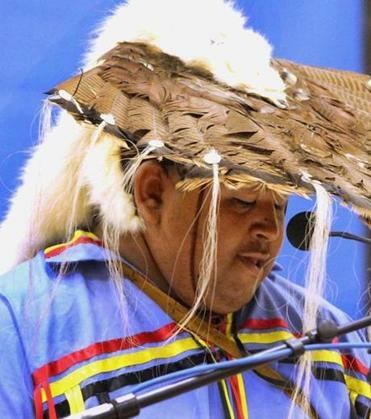 Douglas Pocknett Jr. gave a blessing in his ancestors’ language at the Mashpee High School graduation Saturday. When Doug Pocknett Jr. showed up for his first day of kindergarten, classmates teased the Mashpee Wampanoag boy for his distinctive hair, worn in the long, braided style of his tribe. “The students and teachers really didn’t embrace Doug and his culture,” said his mother, Allyson Pocknett. But 12 years later, many of those same students stood in unison and gave Pocknett a heartfelt ovation after he read a traditional blessing to kick off Mashpee High School’s graduation on Saturday. Pocknett, dressed in full tribal regalia, read a Wampanoag travel blessing in Wopânâak, a language that nearly went extinct in the mid-1800s before being painstakingly revived from written records starting in the 1990s. Though Pocknett is one of nine Wampanoag graduates in Mashpee this year, he is the first student at the school to fulfill his language requirement by studying Wopânâak. He learned the long-lost tongue from Jessie Little Doe Baird, who started the Wopânâak Language Reclamation Project in 1993 and has since compiled a working dictionary of the language using Colonial-era transliterated Bibles and other early written sources. For Pocknett, the applause of his peers and their families was the perfect capstone on his high school career. Pocknett admits it was sometimes difficult to be one of just a handful of Wampanoag students. Baird, Pocknett’s teacher and the linguist primarily responsible for reviving the dormant language, couldn’t be prouder of her student. For Baird, Pocknett’s blessing is in part a manifestation of her years of work. Starting in the fall, Pocknett will study communications and film at Cape Cod Community College. He also hopes to teach Wopânâak to others, helping preserve the language and the culture it embodies for future generations. Mashpee Wampanoag Councilwoman Trish Keliinui, who attended the graduation, said the audience’s enthusiastic reaction instilled her with a deep feeling of pride. Keliinui lamented that the Mashpee Wampanoag are perhaps most known for their proposal to build a casino in Taunton. Baird noted that Mashpee High School’s embrace of Wampanoag culture stands in stark contrast to a recent incident in Alabama, where news reports said that a Native American high school senior’s diploma was being withheld pending payment of a $1,000 fine after she wore an eagle feather in her cap during a graduation ceremony. Dan Adams can be reached at dadams@globe.com. Folow him on Twitter at@DanielAdams86.